Part 1 Technologies: The MIG welding process; Equipment for MIG welding; Shielding gases in MIG welding; Consumables in MIG welding; Flux cored arc welding; Pulsed MIG welding; MIG brazing. Part 2 Quality and safety issues: Improving productivity in MIG/MAG welding; Assessing weld quality in MIG welding; Occupational health and safety in MIG welding; Reducing costs in MIG welding. Part 3 Applications: MIG welding of uncoated and surface coated steel; MIG welding of stainless steel; MIG welding of aluminium and aluminium alloys; Robotic equipment for MIG welding; Optimising the use of robotic MIG welding; Automotive applications of robotic MIG welding; Heavy vehicle applications of robotic MIG welding. MIG (metal inert gas) welding, also known as gas metal arc welding (GMAW), is a key joining technology in manufacturing. 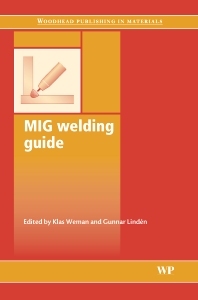 MIG welding guide provides a comprehensive, practical and accessible guide to this widely used process. Part one discusses the range of technologies used in MIG welding, including power sources, shielding gases and consumables. Fluxed cored arc welding, pulsed MIG welding and MIG brazing are also explored. Part two reviews quality and safety issues such as improving productivity in MIG/MAG welding, assessing weld quality, health and safety, and methods for reducing costs. The final part of the book takes a practical look at the applications of MIG welding, with chapters dedicated to the welding of steel and aluminium, the use of robotics in MIG welding, and the application of MIG welding in the automotive industry. MIG welding guide is essential reading for welding and production engineers, designers and all those involved in manufacturing. Professor Klas Weman currently works for WEMAB AB in Sweden. He has previously worked for ESAB Welding Equipment AB and in the Welding Technology Department of the Royal Institute of Technology in Stockholm, Sweden. Professor Gunnar Lindén is Group Senior Expert for Air Liquide in Sweden, where he is in charge of welding technical support. Professor Lindén has lectured and published widely on welding technology.